A study published in the journal Science today reveals a new and unexpected origin for New Zealand’s iconic kiwi and overturns the previous idea that the ancestors of kiwi flew directly over from Australia (see Miocene fossils show that Kiwi are probably not phyletic dwarves, Paleornithological Research 2013, and St Bathan’s kiwi – NZ Birds Online). Professor Alan Cooper (from the University of Adelaide’s Australian Centre for Ancient DNA) coordinated a team investigating the DNA from the giant extinct elephant bird and to their great surprise the closest relative of the kiwi turned out to be the elephant bird , not Australia’s emu and cassowary. 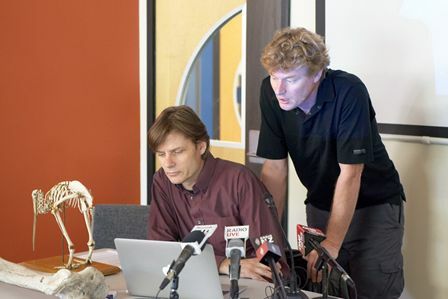 The research team looked for DNA in elephant bird bones in many of the world’s museums but it was Te Papa’s specimens that came up trumps and produced the only readable sequences of DNA. So how did Te Papa end up with elephant bird bones from Madagascar? This is another mystery. Elephant birds died out hundreds of years ago, so any bones must be at least that old and possibly date back thousands of years. We have nine elephant bird bones in our collection. From data written on the bones, we know that some were dug up at Betioky, Tulear Province in the southwest of the island, while others are labelled as being from the centre of island. One of the bones is labelled 1933, so presumably it was excavated that year. All the hand writing is in French. For most of the 19th century, Madagascar was ruled as a kingdom by a series of nobles but the monarchy collapsed in 1897 when the island was absorbed into the French colonial empire, from which the island gained independence in 1960. In the mid-20th century, when the Dominion Museum was the country’s national museum (and a forerunner of Te Papa), many specimens were exchanged with European museums. It seems most likely that these particular bones were initially transported from Madagascar to Europe, then exchanged with the Dominion Museum, perhaps in the 1930s. Wow, what a discovery! Very well communicated. Well done to everyone involved. This really highlights the importance of Museum collections. Museum collections worldwide need continued investment. Investment in collections enables them to receive the best care and continued investigation, so that we can continue to discover the history of our planet. Knowing the history of our natural world enables humans to understand our place in this world and learn lessons of resource and environmental sustainability as we move into a very uncertain future.